Color: Any color is accepted. Coat: Very short straight coat has firm texture that is not coarse and lays flat. Is a Whippet the Right Dog Breed for You? 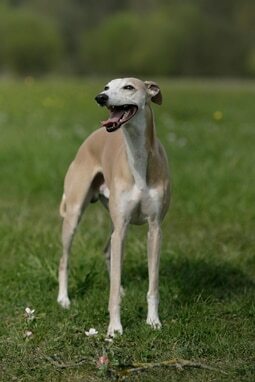 Whippets were bred for maximum speed and agility in races, especially the steeple chase. Most are bred as companion animals today and this breed is affectionate and easy to handle. They tend to be quiet and lazy in the house, but can be spirited outside and when playing. They are gentle and good with children. They do have a high prey drive and like to chase smaller pets and may not do well with cats. They need close human contact and because of their very short coat and low body fat they are best suited to indoor living. They are low shedding with minimal grooming needs.